On March 19 each year Catholics celebrate the Solemnity of St. Joseph, protector of the family and patron of the universal Church and of workers. The importance of this day in Catholic tradition extends throughout the world, but one related custom in particular originated on the island of Sicily: St. Joseph’s Table. The origins of St. Joseph’s Table can be traced to the Middle Ages. According to one tradition, during a famine brought on by a severe drought, starving villagers — many of them farmers — prayed to St. Joseph, asking for his intercession. St. Joseph helped them to survive by eating the fava bean. It was the only crop that would grow in such harsh conditions. So bountiful the crop became that the famine ended. To offer their thanks the people prepared a special feast, inviting the poor and less fortunate among them to share in the meal. The feast of St. Joseph’s Table has been celebrated ever since. The festival ritual begins by what is called tupa-tupa, or “knock-knock.” A group of poor or orphaned children is usually selected to portray the Holy Family, reliving their journey through the Holy Land for food and shelter. The Holy Family enters the house and the bountiful feast begins with the cry, “Viva la tavola di San Giuseppe!” (“Long live the table of St. Joseph!”), which is heard throughout the day. All other attendees must wait until the Holy Family has finished their meal before they are allowed to eat. The St. Joseph’s table itself — also known as an “altar” — is traditionally comprised of three ascending tables, or “steps,” representing both the Holy Trinity and the ascent from earth to heaven. At the center of the last and highest table is a statue of St. Joseph or a picture of the Holy Family. Often the altar is the result of a vow made in the previous year, in which an individual or family promised to build an altar if St. Joseph granted a petition. The altar must never be a source of personal financial gain, and often it is customary for people to beg for supplies to build it. Palms and lily plants typically adorn each of the tables. Vigil candles, usually green, brown and dark yellow, accompany the flowers, representing the colors of St. Joseph. Breads are formed and baked into the shapes of various Catholic symbols, such as a St. Joseph’s staff and various carpentry tools, a chalice, cross, monstrance, dove, lamb, fish or heart. Some of these elaborate breads are not eaten as part of the meal, but later given to the poor. Bottles of wine are also placed upon the altar, as well as assorted fruits such as grapes and lemons. The various culinary treats that form the meal are each blessed by a priest; thus the food is never to be thrown away or wasted. Because the feast of St. Joseph falls during the Lenten season, meat is not a part of the meal. The main course is a pasta dish containing sardines, tomatoes and fresh fennel, and sprinkled with breadcrumbs to represent the sawdust of a carpenter. There are several names for this dish, but it is often called pasta con sarde, pasta con mudrica orpasta Milanese. Various soups made of lentils and vegetable dishes such as stuffed artichokes, broccoli and fennel, as well as the all-important fava bean, which is often served roasted and lightly salted, accompany the pasta. As with all things Sicilian, the meal is followed by a tasty assortment of desserts: various cookies, zeppole and the famous St. Joseph sfinge, which is a round cream puff filled with ricotta cheese or cream and adorned with candied fruits. The food that remains is given to the poor, along with any money that guests may have contributed. An important mark of a religious feast is its social dimension. 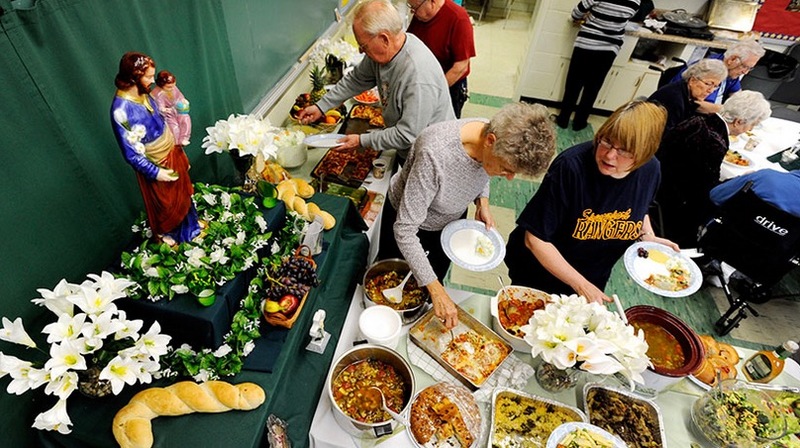 St. Joseph’s Table is a celebration of family, in honor of the protector of families. It is not merely a private celebration: In addition to private altars, public altars have been traditionally built at the village churches in Sicily and here in the United States. In New Orleans, for example, the first St. Joseph altar was built on the front steps of St. Joseph Church on Tulane Avenue in 1967. The feast has been celebrated by Italians in New Orleans ever since. St. Joseph’s Table is an expression of gratitude for the simplest things in life, such as a crop of fava beans that grew at a time when the fields were otherwise dry and barren. Sicilians often call fava beans “lucky beans.” Those who keep the fava bean in their pantry are said never to run out of food. This attitude of humility is exemplified in the various preparations that go into making a St. Joseph’s Table, from the construction of the three tables to the basic, simple ingredients of the food. It is quite fitting, then, that the Solemnity of St. Joseph occurs during Lent, a time of reflection, humility and almsgiving. Scott Noto, J.D., practices law in Grand Rapids, Mich., and has written for several Catholic publications. Why are there two feasts for St. Joseph?